involved in crop-livestock research and held several managerial positions thus an Assistant Director (2000-2002); Deputy Director, Research and Technology (2002-2005) and the Director General/CEO of KARI (2005-2014). Upon his retirement from the public service, he became a consultant in crop-livestock systems with the International Livestock Research Institute. During his career as a researcher, Dr. Mukisira acquired skills in research management and implementation, setting of research priorities, monitoring and evaluation of major research projects, in effective team building and in sound management. Initial activities in KARI involved planning and undertaking livestock research activities in a regional setting . In subsequent years, he was instrumental in building and sustaining the current research infrastructure at KARI, embracing strategies for technology generation and up-scaling of appropriate technologies; this impacted positively on the livelihood of many farmers and pastoralists. He also played a leading role in establishing operational frameworks for engaging the public sector, private sector, the development partners and key stakeholders along the commodity value chains. In 2008-10, he served as the Chairman of the Board of Directors of the Association for Strengthening Agricultural Research in East and Central Africa (ASARECA) in Entebbe, Uganda. 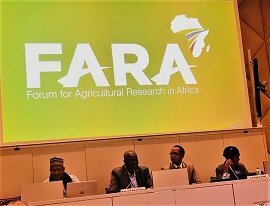 Within the same period, he served as a member of the Board of the Forum for Agricultural Research in Africa (FARA) in Accra, Ghana. He also served as a member of the World Council of Animal Production (WCAP), and at one time served as Secretary to the All Africa Society of Animal Production, and a Board Member at the Commission for Science and Technology, Kenya. Besides, he has served on regional and international agricultural research committees and Technical Advisory Boards for several Projects/programmes. Dr. Mukisira has published several articles in referred journals, in conference proceedings and represented Kenya in key policy dialogue meetings, regionally and international. He has contributed to the publication of 3 books for use in the agricultural sector. He has also won meritorious awards, locally and globally, in recognition for his outstanding contribution to agricultural research and development. His research focuses mainly on crop – livestock integration; Fodder/crop residue improvement and utilisation; Nitrogen usage in ruminant and non-ruminant nutrition; Rumen function; Characterization of anti-nutritive factors, mostly in non-conventional protein feedstuffs; sustainability of technologies, environmental effects of various technologies and the integration of gender in agricultural R&D activities. In recognition of his distinguished service to the Nation, President Kibaki decorated him with the Order of the Grand Warrior (OGW, 2007) and the Moran of Burning Spear (MBS, 2010).